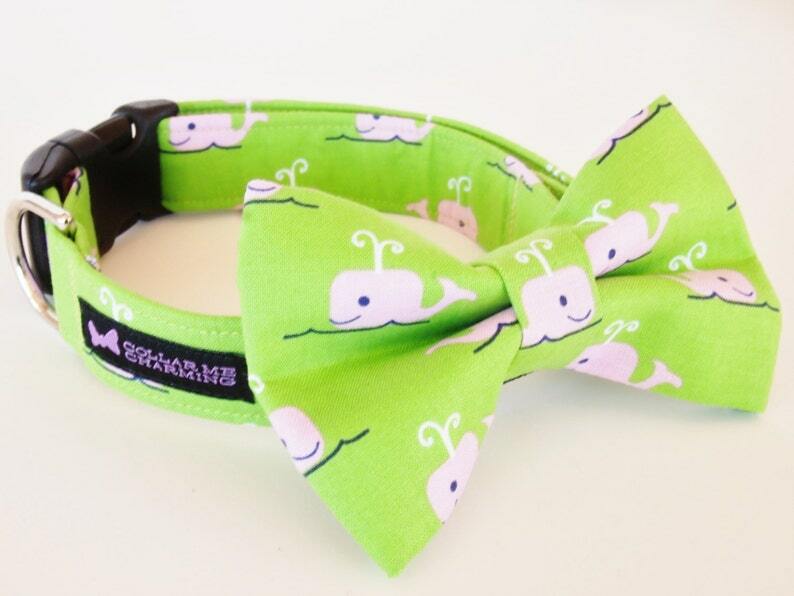 This listing is for a dog collar and bow tie set Beluga. Show off your pup in this trendy collar bow tie set! All bow ties are removable and are attached with Velcro and a stretchable strap to keep it in place. - Each collar is constructed using quality hardware, strong nylon webbing with interfacing, and each is triple stitched to ensure you can still play hard with your pup. - We only use curved side release buckles, designed to hug your dog's neck, so they can be comfortable and stylish too! Want a specific size made especially for your dog? Is your pooch going to be in a wedding or special event and needs a custom collar to match the rest of the party? Convo me for a custom order and we will be sure to make them the perfect match..